Do you like jewelry making? Are you a handmade crafts lover? If you are interested in jewelry making or trinkets DIY, you can get some useful tutorials from my blogger. I will share our ideal on how make all kinds of jewelries, including bracelets, rings, necklaces, earrings and other jewelry sets. You can also tell us your favorite jewelry style and we will find ways to make it. This bracelet is made by colorful glass pearl beads and white seed beads. It is not too hard to make. Let’s do it together! First, you should prepare the materials that will be needed in this jewelry making. And some tools you may need in the process of jewelry making are iron beading needle, jewelry pliers and iron scissors. Put three wires across the bead cover. Thread the glass seed beads and pearl beads in the three wires separately. Put the end of wires into one bead cover. Add the lobster claw clasp with the jump rings. Here is the final look of the pretty beads bracelet. What do you think? Have you got it? If you have any problem, you can leave a message. Thank you! Summary: Different kinds of colors make different beads. This jewelry set is made up by four colorful beaded bracelets. Each of them is beautiful and bright. And it is so easy to make them. Let’s enjoy the jewelry making journey! To make these colorful beaded bracelets, you just need to prepare some glass pearl beads strands, iron round spacer beads, crystal stretch elastic craft wires and other basic jewelry making materials, then you can follow our tutorial to make them at home. Put the headpin through one pearl bead, and make the point of headpin bend into a circle. Add a jump ring on the circle wire. This is the pendant bead. Thread all the beads together. One pearl bead and one spacer bead as the picture shows. Remember tie the wire a knot. Beautiful crystal spring bracelet made by three kinds of beads is very fair and excellent for the coming season. The green-blue color is just like the feel of spring, full of vigor and hope. I think it is a good gift for the coming Easter. Now i will teach you how to make it. Thread seven white glass seed beads and put the wire crossed in one bead. Thread one crackle glass bead and one imitation bead as the picture shows. Repeat the steps to thread the other beads. The key is to cross the wire in every node so that the spiral effect can come out. Add the jump rings in both points of the bracelet, then thread the lobster claw clasp. When you finished all the steps, you will certainly get a beautiful bracelet. 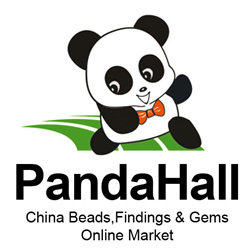 The white seed beads interspersed in the green-blue beads present the effect of spiral line. If you buy a large number of materials at one time, you will get some discount. And the April promotion is going on, you can get many products on sale. That is fabulous! Today i will introduce you a DIY project of button flowers for kids. You can do it with your children. And if you are a kindergarten teacher, it will be useful for you to get another skill. This project is very easy to learn and convenient to practice. Now, let’s begin. The first step is to prepare materials the project may need. What you may need are buttons, wires, wool and scissors. If you want to make a pot of button flowers, you can prepare a bottle or a pot and some sponge. Pick three buttons, a 1-hole, a 2-hole, a 3-hole button. One flower is made by three buttons with different sizes. Stack them together from small to large one. The biggest one is in the bottle and the smallest is on the top. Thread the buttons in the wire. You don’t need across every hole of the buttons. Just firm them. Put the rest wire across the hole from the opposite direction. And twist the rest wire together. Wrap the wool cord around the wire. And fix the wool cord in the bottle of wires. One button flower is finished. Make other button flowers in the same steps of 1-3. Put the bunch of button flowers together and stick them in the sponge of bottle. Is it very easy to learn? Let’s have a try right now.